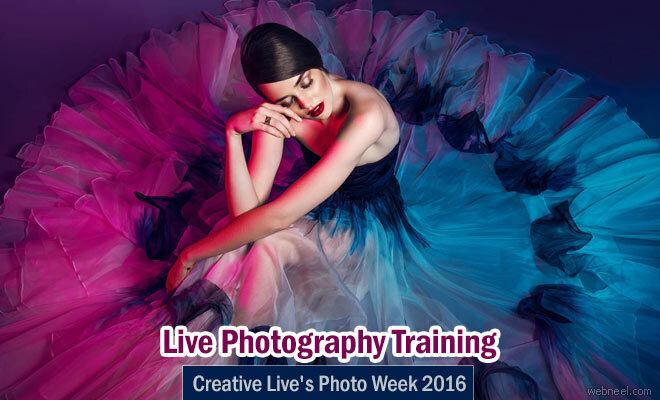 The Biggest online photography education event, the photo week 2016 is organised by Creative Live. 24 live classes are taught by expert photography instructors which can watched at home live for free. Learning new techniques,tools and gaining insights from best instructors are highlights of the training program. Photo Week is happening from September 26 to 29,2016. Here’s just some of the topics being covered during Photo Week 2016: In one week, we will cover everything you need to create jaw-dropping images, make money following your passion, and grow your photography business to the next level. How to pose your subjects, using the most flattering techniques. How to work with models and get the best out of them, every time. Break into concert, sports, food, and fashion photography. Build a portfolio that makes an impact and sells your work. Use lighting to create the perfect mood for your photos. Compositing, color correcting, and color theory and much more. PLUS, our In Focus series kicks off everyday with conversations with some of the leading names in photography to help give insight into their process, what makes them tick, and how they built their success. FREE: Watch any class live for free, online. $199: Get the entire bundle — all 24 classes and Behind the Lens talks from NYC and SF — on demand to watch anytime. $499: Take it all in from NYC with our VIP experience. A guaranteed seat in-studio each day, VIP seating for our Behind the Lens talks, entrance to all after hours events, access to the Photo Week 2016 wrap party, and image critiques and portfolio reviews by our top-tier instructors. But space is limited! Only 25 students will be able to have a front-row seat to this special industry event.